Digital calendars such as Microsoft Outlook or Google Calendar are invaluable when it comes to scheduling tasks and meetings for work. But as more of our lives are planned online through Facebook events and email invites, calendar apps are increasingly useful for organizing social and personal time too. Your smartphone comes with a calendar app of its own, but a raft of third-party apps offer more powerful productivity features for organizing events for your family or a group of colleagues, as well as for managing personal to-do's and shopping lists. 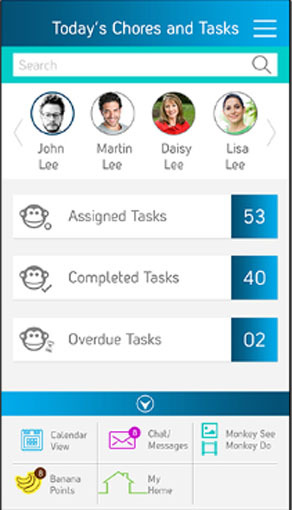 You can even assign particular items to various members of your household or office team. 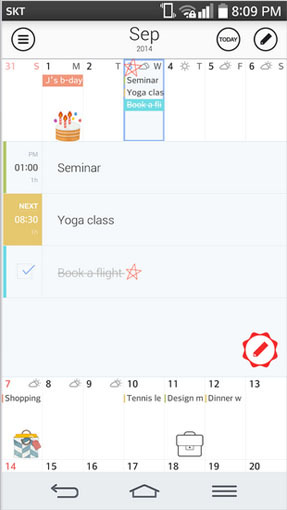 We looked for apps that had unique and useful features that would make them the best for managing work, family or personal lives, along with intuitive design, the ability to integrate with other calendars, and robust performance in the basics – event creation and display. Here are our top picks for calendar apps. There's a great Douglas Adams quote about how “we're stuck with technology when what we really want is just stuff that works”. Fantastical 2 is kind of like that for the technology of calendar apps. It's incredibly easy to set up, automatically syncing with the default iOS Calendar and Reminders apps, and only a few extra taps to sync other calendars. For example, if you have a work Microsoft Exchange calendar in addition to a personal calendar you can sync both. The monthly view is easy on the eyes and displays events color-coded by calendar – so that if you have five events from three different calendars, that date will have five dots in three colors underneath it. From there you can easily change the time of an event by dragging and dropping. Creating events is simple – typing out the event, location, date and time automatically creates the event, while starting a sentence with the word “task” creates a reminder. Opening an event reveals a killer feature – the ability to view the location on a map and launch it in a navigation app. This sleek, intuitive app adds some cuteness to the burden of scheduling appointments and reminders, thanks to a regularly updated selection stickers you can use to mark special days or events. And the stickers are many – from cupcakes and tiny barbells to any combination of hand signals, they give any emoji keyboard a run for its money. For the weather obsessives, integration with local weather information adds location-based temperature and conditions to each event. There are also widgets for the agenda, monthly or today view to put on your Android homescreen. 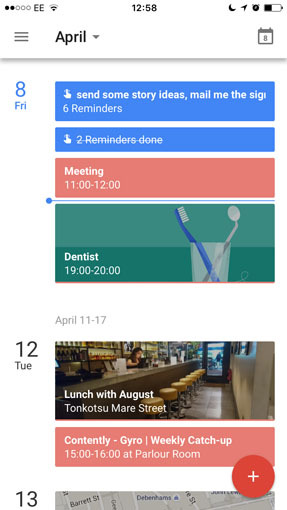 Along with events, SolCalendar syncs with Google Tasks to get all your to-do's in one place. The interface is intuitive, with tap-and-hold to move, edit or delete events, and gesture based navigation to switch between daily, weekly and monthly views. For busy parents who need to coordinate work, house maintenance and extracurricular activity calendars, Cozi is an easy-to-use, intuitively designed freebie. You can create events that include only some family members – so that only they receive the reminder – and each family member has their own color-coded dot to identify which events and tasks are relevant to them. However, you can't sync existing calendars (for example, your kids' activities calendar on Google Calendar or Apple's iCal), which means manually re-entering such information or choosing a read-only view of appointments. Great shared features include a Today page that displays upcoming events, color-coded by who's attending, tasks sorted by the person doing them, and shopping lists. Each member of the family can also post messages, thoughts and pictures in the Journal – a cuter way to stay in touch than mortally embarrassing your offspring on Facebook. There is a premium version that adds features, including a birthday tracker, a month view of the calendar and a shared contacts book for mutual friends – but these paid-for extras are not central to the functioning of the app. This app offers a fun twist on the family calendar by gamifying household chores to encourage children's involvement. A Kickstarter success story, House Monkey lets you schedule house chores and regular maintenance tasks and assign them to various members of your family. Each task can also be set to offer an in-app rewards (bananas, naturally), that can be saved up by the chore-doer to cash in for treats that you create—say, a weekend trip, or tacos all weekend. 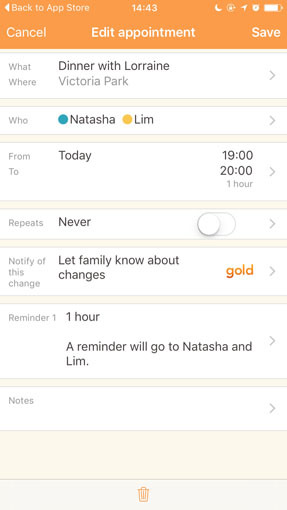 Each family member can delegate or tag other members to complete tasks and everything is recorded on the app. For the staid but necessary chores, adults can get on the web-based version to view, export or print out home maintenance records. 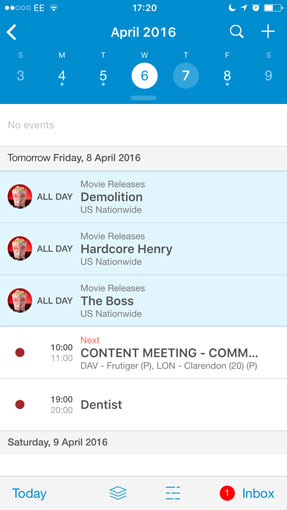 This app offers an interesting twist on the work-life balance with layered calendars. In the front is your main calendar, while the back calendar is comprised of events from public calendars you can follow based on your interests, from local arts events and national movie releases, to finance reports from specific companies. Swiping two fingers lets you switch between the two calendars, so you can keep up on outside events without cluttering up your own appointments. On the office end of things, there's a dedicated Inbox tab showing meeting invites that need a response. Creating events is a simple process (though it lacks any natural language parsing to automatically add events that some other apps offer), and you can also share your calendar with contacts via email from within the app. UpTo syncs with Google Calendar, iCloud, Outlook, Facebook Events plus any calendar that syncs with your phone. While Google's refreshed calendar app is the default on Android devices on 4.1 and newer, it's an excellent download for iPhone users too. Of all the free apps we tested, it offers the quickest, most natural way to create events. As you type, the app can parse location, time and event type – for example, it recognizes the words concert, dinner and meeting, and tags such events with relevant icons and images. Restaurants and landmarks are accompanied by their Google Maps images, making for a colorful Schedule view, which displays a streamlined, scrolling list of upcoming days where you have events. However, if it's crucial that you have an overview of your month or week, Google Calendar's monthly and weekly views are less informative – the monthly view doesn't show which days you have events, while the weekly view too cramped to reveal what scheduled items actually are. Play store doesn’t bring up anything if you type in Cal but if you put in calendar 20th on the list is Cal Google Calendar and Exchange, Any Do. Is that the one you are talking about? CalPal is a new calendar app my co-founder and I recently released to the iOS App Store. CalPal makes it incredibly simple to share plans between multiple users and provides build-in group messaging for each calendar event. As a result, the messaging, the calendaring, the remindering and the syncing all happen in one place, reliably, for anyone associated with an event. CalPal users report that it’s by far the most reliable way to make plans for the future between multiple participants (and for themselves). We’re all about empowering people to do more with their time and have found that the CalPal calendar system (which also syncs with all your existing calendar) has resulted in vast lifestyle efficiencies and improvements for our users with very little additional effort. By the way, you can learn more about CalPal or download the CalPal app from the App Store here: http://bit.ly/1hSvsWw! I’m still trying to find an IOS calendar/event/alarm app that gives me the option to select “third Friday of every month” (for example). All the apps I find offer the option of every particular day, once a week, once every 2 weeks, or once a month; none of them meet my needs. You can do it with Google Calendar. In your Google Calendar, go to the day that you want your recurring event to start (which should be the correct week and day going forward) and click on the time slot that you want to create the event. A box will pop up for you to fill in the information for the appointment. Select “Edit event”. On the appointment page, click the box next to Repeat. Under Repeats, pull down and select Monthly. Then select the button next to “day of the week”. You can then choose to have the recurring appointment end by a certain date, after a number of occurrences or never. At the bottom, you’ll see next to Summary the confirmation for your choices. It should say: Monthly on the third Friday. Thanks so much. Just installed it. I appreciate your help.